If imitation is the sincerest form of flattery, Scion is feeling pretty flattered. Once alone as the only quirky Oriental box, its xB has recently gotten rather blatant competition. But no worries for Scion, as the second-generation xB more than holds its own against the newcomers. It's the most Americanized of the bunch. Which means biggest and roomiest, and most powerful. But note that here "big" is relative -- the xB is no monster SUV, or even more demure mainstream crossover. It still stands on a rather small footprint, but a few inches more length, and a touch more width and, hard to believe but true, height make for more useful space inside, without excessive outside. While it has a larger engine than the original, or its competitors, with 2.4 liters displacement and 158 horsepower (versus the original 1.5-liter/108 hp and competitive 1.6 to 2.0 liters and 120 to 140 hp) it's equivalent to or better than the competition in acceleration, handling, and fuel economy, and can be easily outfitted for further improved handling. Changes to the xB since Version 2.0's mid-2007 debut have been minor in most traditional respects. As is the Scion way, it's offered in one specification, so customers need only choose exterior color and transmission type -- the same five-speed manual or four-speed automatic as ever. That makes basic ordering simple, and and helps keep production and customer costs down. Don't think that's a new interpretation of the old "any color you want as long as it's black" philosophy -- although the basic specification is limited, there are a nearly unlimited number of dealer-installed add-ons, to enhance exterior style, interior comfort, convenience, and electronic entertainment, or ride and handling. De-contented econobox the xB is most definitely not. Power steering, windows, mirrors, and doorlocks, remote keyless entry, air conditioning, cruise control, four-wheel antilock disc brakes, VSC stability control, and a full complement of air bags are all standard. The pre-delivery option list is comprehensive enough for most people, and if anyone needs even more, there is a healthy aftermarket. Audio is featured this year, with a standard 160-watt Pioneer system with AM, FM, CD (including MP3 and WMA), with auxiliary jack, USB, and iPod connectivity standard. Not enough? There is also a premium Pioneer system, or an even more upscale Alpine system, which can also be specified with an integral navigation system with voice guidance and map coverage not only of the continental US, but Canada, Puerto Rico, the Virgin Islands, and Hawaii as well. My test car came with that system, plus XM satellite radio, and seven-inch DVD monitors for rear seat passengers in the rear of the front-seat headrests. Did someone say "lounge on wheels?" Audio-visual lounge at that... and those entertainment options don't mask an inferior vehicle. The xB is a cut or two above most cars at its modest price level in specification, with the build quality expected from a Toyota product. It may be fun to look at, but "entertainment" doesn't just refer to the audio-visual systems. It's quick enough to be fun, even with the automatic, and suspension upgrades from TRD are just a check on the order sheet away if desired. Sometimes original is best. COMFORT: Headroom is not going to be a problem here, even in the rear seat. Nor is legroom. Three in the rear is cozy, but better than expected thanks to a flat floor -- and the rear seat folds 60/40 to expand cargo ability when necessary. The front buckets recline fully for short naps, and the tilt-adjustable steering wheel can be pushed up if necessary. Seat comfort is better than expected at the xB's price point, and visibility is good, except directly over the shoulder toward the rear quarters because of the thick C-pillars. Use the outside mirrors. The color scheme and materials are standard sporty compact, with dark cloth upholstery and dark interior panels offset by bright trim. As in the original xB, the instruments are in the center of the dash, placed forward toward the bottom of the windshield. While initially unusual, you'll adapt quickly, and that position is easier to focus on and forces the driver's eyes to keep moving - both good safety features. Instrumentation is complete, with a digital speedometer, analog tach, fuel and engine temperature gauges, the usual warning lights, and even a trip computer, a rarity in the price class. A storage tray under the rear seat provides a reasonably secure spot to store small objects, and there is more hidden small-item storage under the rear load floor, above the space-saver spare tire. The tailgate opens in the standard top-hinged manner. Both the audio and navigation components of the new Alpine premium audio system are simple to operate. SAFETY: Standard safety equipment in the xB includes variable-deployment front, seat-mounted front side, and full-length side curtain airbags. Crush boxes absorb low-speed impact energy and help protect the main unibody structure, while reinforcement of the door, roof, and rocker panel areas further improves passenger protection. NHTSA ratings are very good - four stars for driver and front passenger frontal impacts, five stars for front- and rear-seat side impacts, and four stars for rollover protection. Four-wheel antilock disc brakes with brake assist, electronic brake-force distribution, vehicle stability control, and traction control are standard. RIDE AND HANDLING: In standard trim, the xB's independent MacPherson strut front, torsion beam axle rear suspension is tuned moderately firmly, for a good balance between ride comfort and sporty handling. The electrically-assisted power steering requires moderate touch, appropriate for its level of sportiness. Even in stock form it's fun to drive and responds well to driver inputs. Increased response can be added according to driver desires and budget. This test car had TRD (Toyota Racing Development) lowering springs, which lower the car for looks and also lower the center of gravity, improving handling. More performance-oriented TRD kit is available, with spring, shock, stabilizer bar, and wheel upgrades on the menu. With the lower (and perhaps a little stiffer) springs, my test xB was enjoyable without being anywhere near punishing, and still had enough clearance so I wasn't unduly concerned about normal, everyday road hazards, although I did put a 2x6 in the rolled curb gutter at the end of my driveway. PERFORMANCE: No power shortage with the xB's 2.4-liter four-cylinder engine. The four-speed automatic may compromise performance a little, maybe, but the engine is a typical Toyota torque monster so the "stick or automatic?" decision is strictly personal preference. With the wide torque band and strong low- and mid-range performance, the automatic is just fine, and it has sequential manual-shift mode when manual shifting is desired. The engine, shared with the tC coupe, is a typical Toyota powerplant with aluminum alloy block and head, and dual overhead cams with VVT-i variable cam phasing for improved performance and reduced emissions. With 158 horsepower at 6000 rpm and 162 lb-ft of torque at 4000 rpm, it does not need to be revved for power. 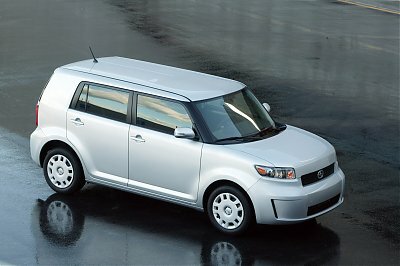 CONCLUSIONS: Even with direct competition, the Scion xB is unique. Bento box meets lead sled. Engine Size			2.4 liters / 144 cu. in. Wheelbase / Length		102.4 in. / 167.3 in.